A video released by Facebook page North Korea Girls 북조선녀성 reveals that an enormous LED light wall that has been added to the massive pyramidal Ryugyong Hotel in Pyongyang, North Korea. In the minute-long video posted Monday, seemingly taken from a car passing by the hotel, the facade of the hotel was lit with flashing animations of lotus flowers, ornate landscapes, spinning lights, and ending with a political statue standing in front of a backdrop of colorful fireworks. The social media page North Korea Girls is a community in Pyongyang, Korea. Affiliated with the website friend.com.kp, the page delivers anonymous pictures, videos, and news from North Korea with English-language narratives. 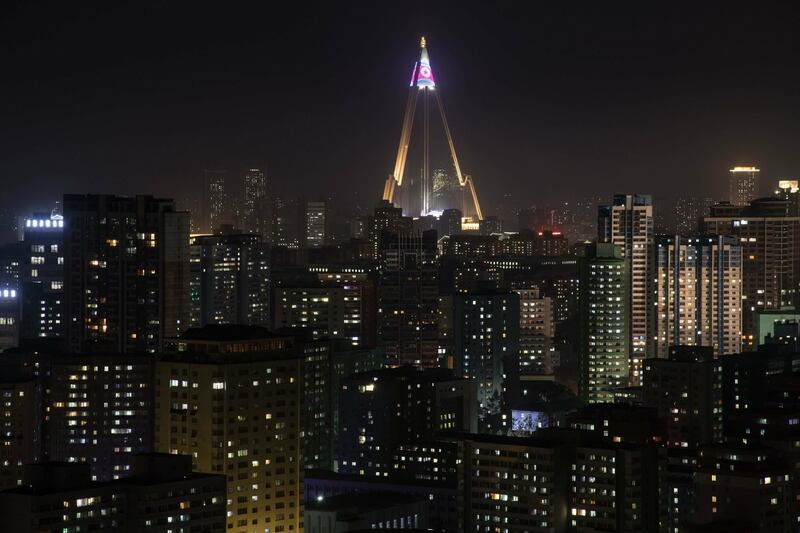 The post-modern, pyramidal structure was supposed to host “restaurants, offices, and hotel rooms.” It remains unclear whether or not the North Korean government is determined to complete its construction in the near future.